I'm kicking off my Blog Book Tour today here at my favorite book review blog, The Book Bundle! To celebrate I've lined up a little Q&A with one of my favorite characters from my new book. So without further ado, please give a warm welcome to Greek God Eros, from the new YA novel, FORESIGHT: Book 1 of The Gods of Fate trilogy. Me: Hello, Eros. Thanks for joining us today. Eros: Yes, well, I lost a bet. Me: Er, really? Well, thanks just the same. So out of curiosity, who did you lose this bet to? Eros: My wife. She finds amusement in my discomfort. Me: I see, well, let’s get started. So I see you also go by Cupid? May I call you Cupid? Eros: Not if you want to survive this interview. Me: Oh, alright. Why don’t you want to be called Cupid? Me: Moving right along… How did you first meet Christopher LeFey? Eros: I went on a surfing trip with Hermes during Hurricane Camille. Great swells. Christopher was there also. That night he taught me a card game called Texas Hold Them. It’s rare for Gods to mingle with Fae, but he seemed alright, for a Faerie. We have a standing Thursday night poker game in Vegas. Me: What was it like growing up on Olympus? Eros: Boring. Opulent. Though my father once gave me a Risk game as a gift. I didn’t realize until the fall of Rome that it wasn’t just a board game. I burned it. Me: What is your favorite game? Me: Oh. Um, so tell me about your parents. I mean who were they? I’ve heard you were the son of Gaia and Uranus but I’ve also heard you were the son of Aphrodite and Ares. Which of these is true? Eros: Neither. I am a child of Chaos. Me: That’s interesting. I thought you were the God of Love? Eros: Misconception. I’m the God of Lust. Me: I see. Do you have any children of your own? Eros: Two. A daughter, Bliss, and a son, Dizasteron. Me: Dizasteron? Isn’t naming your kid that sort of, like, asking for trouble? Eros: You have no idea. Me: When I see depictions of you, it’s usually a winged baby. But you look more like the Old Spice guy. What’s up with that? Eros: Yes. In my youth I spurned the attentions of Athena. Besides being the Goddess of Wisdom she was also the Goddess of the Arts. On a side note, she should have added “the Goddess of Vindictive Clingy Women” to that list. Also, I hate the Old Spice guy. So what if he can ride a horse backwards? I can make Simon Cowell make out with a mime. Me: What do you do for fun, besides board games? Eros: I enjoy most water sports. I also enjoy watching the Bachelor. Eros: It reminds me of my childhood. Me: Oooookay. Well, thanks for that disturbing mental picture. I have a few fan questions for you are you ready? Eros: I did not create sexual preference. It has existed in humans (and animals) forever. However I believe if women weren’t so crazy, there would be more straight men. Eros: I have nothing to do with true love. It exists; it’s just not my specialty. I deal in more carnal things. However I will say that it is not the gods, but your own free will that causes the majority of your pain and confusion. Eros: When you take it. From Pat: "What are your magic arrows made of?" Eros: Adamanteum. Like Wolverines claws. No, kidding. Trade secret. Though all our weapons are created by Hephaestus. From Nikki: "Do you smoke?" Eros: Only when I'm on fire. Don't laugh. It happens surprisingly often. Eros: Keep it up human. Me: Um, is that a pistol crossbow you’re holding? Me: Um, er, okay. Here's your chance to ask Eros a question of your own! Leave a question in the comments and he'll swing by for the next few days and give you the answer! 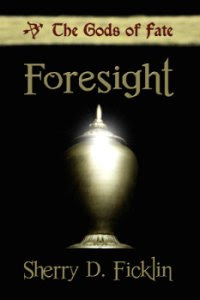 At the end of the week I'll choose a random questioner to win a cool FORESIGHT prize pack! You have till Monday Aug. 30th to enter! Good luck, and happy reading! FORESIGHT is now available at Amazon.com and Barnes and Noble.com! So, what's the biggest bet that you've made with someone and lost? And for that matter, what's the best bet you've won? She is an amazing woman. And her parents left her as a sacrifice to the Gods. I rescued her. Then she rescued me. She still rescues me, mostly from the home shopping channel. I once won a bet that I could make Julia Roberts fall for Lyle Lovett. Hermes lost big time on that one. He had to refer to me as "the All Powerful and ALL Knowing OZ" for a week AND he had to wear a dress to that week's poker game. The biggest bet I ever lost was with Hades who wanted me to make a hit tv show. Unfortunatly 'Tempataion Island' flopped after one season and I had to walk Cerebus for three months. That is one nasty puppy. love it. Thanks for the answer to my question Eros. Thanks for answering my question Eros. Got another one for you. Is there anything you absolutely DESPISE about being a god? I mean, you have all that power, but really are you actually happy with it? There is only one downside to immortality, and that is immortality itself. We tend to out live people we care about. For that reason we try not to associate too closely with mortals. I was fortunate to have my wife gifted with immortality so I never have to be without her. Others of my kind are not so lucky. Congrats JessG!! You are our giveaway winner!!! Send your addy to sdficklin@bresnan.net to claim your prize!!!! Thanks everyone for your coments! Awesome! Thanks so much! I sent you my info. :) This was so fun! Thanks Eros and Sherry. Wonderful job!